Content marketers and copywriters can juggle a number of projects at once. Yet, switching between brand stories and voices might take a minute or two of reacquainting yourself with company goals and objectives. 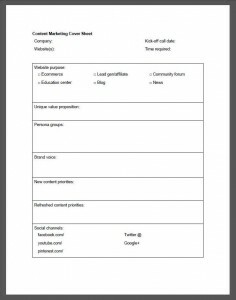 I have a productivity tip for you to ease the transition between clients’ content projects: Create a content marketing cover sheet for each client. I keep mine at the front of the file folder for each client where I also keep notes taken during meetings and other papers related to the project. I fill out the cover sheet after the content marketing team’s first call with a new client. During this call we review the client’s responses to our content marketing questionnaire. The questionnaire uncovers the brand’s marketplace differentiators, competition, known audience groups, brand voice, content successes and failures, among other things. Here you’ll find a bullet list of topics your questionnaire can ask to understand brand identity and competitive landscape. There are also some helpful suggestions for client and project management through the early stages of a content development project. Also included are tips for non-writers — those who may run the business and may be the best person for a customer to talk to but who hasn’t been able to carve out time or doesn’t know where to begin writing for the business online. In part 2 of this content boot camp series, we walk you through interview questionnaire drafting process. It’s a practice involving asking the right questions and looking for info without knowing what it is you’re looking for. This whole series, by the way, is a must read for anyone writing copy for the Web. Matching your message and voice to the client and their audience requires an insider understanding of the business, insight you’re hoping to uncover through this questionnaire. The information you gather from the client interview process is the base of all the content you’ll write and edit. After you have a comprehensive understanding of the goals driving the business you can distill it down its essential parts in a project profile. Here’s the copywriting project cover sheet I use myself. It’s self explanatory, though I’ll make one more note. For unique selling proposition I like to keep it to a sentence or a couple bullet points since that’s all you have to catch a customer’s attention in the crowded online marketplace. With a cover sheet created at the outset of the project, you have a constant road map to your content creation efforts. You’ll save time and mental power moving between projects. And you’ll have undertaken an exercise that brings you to a high level of intimacy with the brand and the people it wants to reach. Nice article. Also FYI the link to “Tackle SEO Web Content Writing with Ease” is broken.